Months before the wedding, the couples will take their wedding photos, usually with a theme in a beautiful location. 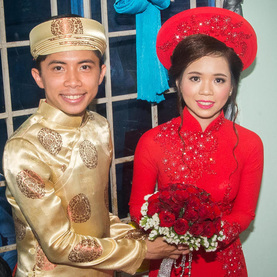 The wedding ceremony and the party are completely separated. 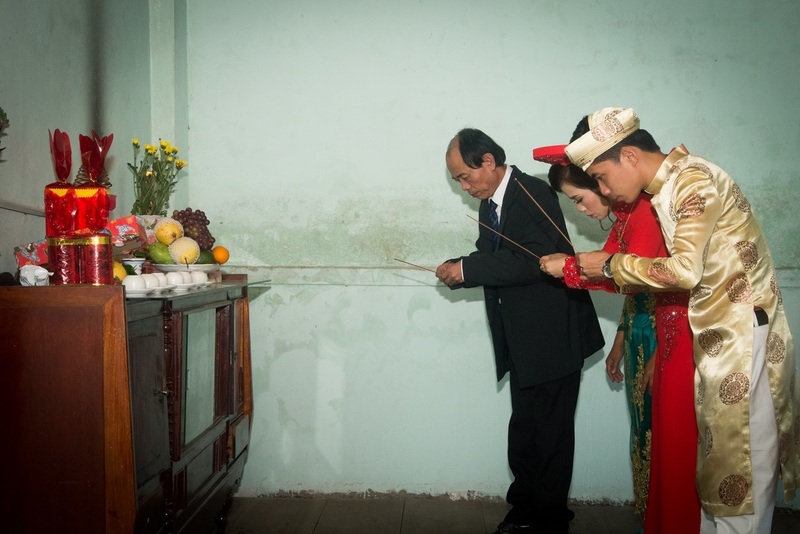 The ceremony is usually taken place at home or in a church (if the couples are Christian), with only relatives and very best friends attending. The party is usually in the evening and even when you see it says 5pm in the invitation, don't arrive at that time unless you want to be the first guest there since in most cases, the party will only start after 7pm. Nowadays, wedding party is often organized at a restaurant and sit-down is more common than buffet, with hundreds (sometimes thousands) of guests. But why so many guests? Simply because not only friends of the couples are invited. It is interesting to know that the majority of the guests are friends, neighbors, relatives and even business friends of the parents. So there are chances that you can share a table with people who don't know anything about the couples, except the fact that they are children of their friend. Another thing to note here is that there can be live music during the party. Unfortunately, such live music is mostly performed by amateur singers, guests who volunteer on the spot and in most cases, are badly drunk. So be prepared for your ears to be tortured! A tip here is not to sit near the speakers, if you can have the options. 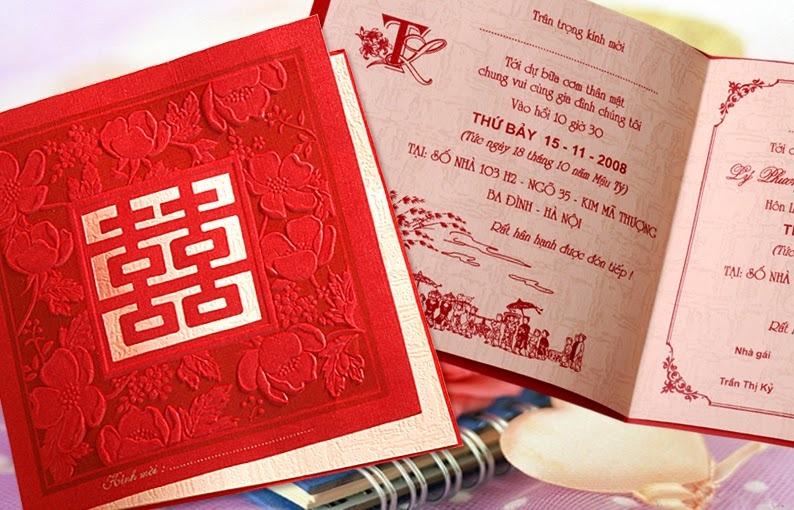 Since wedding gift wish list is not very popular in Vietnam, in most cases you come to the wedding with cash in an envelope. A tip here is to use the exact envelop that contains the invitation card (with the card removed) so that the couples can know whom it comes from. Usually the couples will take note on how much they receive from each guest, so that they can give the same (or higher) amount back when they are invited to that guest's wedding in the future. So how much should you put into the envelop? Well, it depends on the restaurant but the rule of thumb here is that it should be more than enough to cover your meal. At the time this is written (2016), 1 million VND (approximately 50 USD) is a good amount and if you are generous, 2 million VND (around 100 USD) is definitely sufficient enough in most of the cases. Please also note that since you are a foreigner, people may expect a "higher than normal" amount from you. I It doesn't sound right but sadly, it may be true in some cases.